Throughout 2017, I splurged a bit too much on makeup, and I really don’t want to go through the receipts and find out how much I actually spent. But I thought I’d do a post on the eyeshadow palettes I purchase in 2017 and which one I feel is the best. These are the palettes that I purchased and also got gifted from the beginning of 2017, till the end. The Morphe 15N is so beautiful, and super affordable, I love all of Morphe eyeshadow products as you are getting the much more for the price that you pay. This palette was a limited edition piece that went with the Morphe’s holiday collection. It comes with a mix of matte and shimmer shadows to create the perfect evening look, it can also be used to create day looks too. 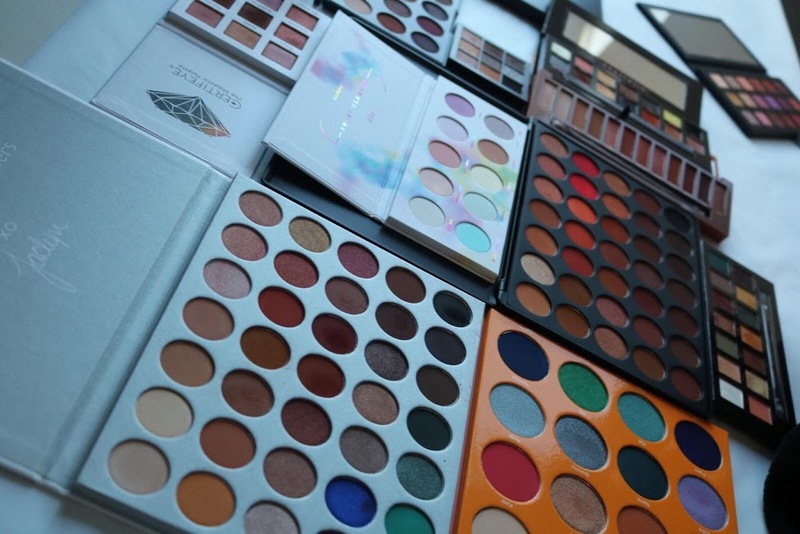 The Morphe 35O2 is part of the 35O family, the 35O, 35OM AND 35OS collection. This palette was launched to celebrate two years of the original 35O palette. Super affordable, creamy and can be easily blended eyeshadows that goes with the fiery oranges and brown collection. My favourite eyeshadow palette out of 2017? I have three, because I’m extra like that, and the three that I have picked have their own reasons as to why I love them so much. This palette is bit on the pricey side, but it is so beautiful, it is super pigmented and creamy. It is easy to blend, and definitely worth the money. The packaging is a bit more better now with a mirror. Huda was inspired by the desert when she created this palette, it comes with matte, shimmer, and actual pure glitter in the palette, it is one of my favourites. This palette can be used to create everyday simple eyes, dramatic Arabian eye looks, or whatever eye looks you wanna do, if you can, then invest money into this palette. Again, it’s not cheap, but I strongly feel Urban Decay win with whatever eyeshadow palettes they bring out. So any of their palettes are worth the money. I reach out for the Naked Heat palette on a regular basis when I have the time, the warm browns and burnt orange shades are definitely my go to looks for that grungy eye makeup I love. It comes with brown mattes to build up your crease to glimmering bronzes to give it that pop whether it’s day or night. again, if you can, then purchase it, if not, then look into buying the Morphe 35O palette as an alternative. I feel like this palette was the hype of 2017 in the makeup world, it’s not as affordable as the normal Morphe palettes, if you’re not that crazy into makeup unlike me, then give this one a miss. But, if you are a makeup artist or are a makeup enthusiast then you can splurge out on this palette. This palette was designed by the YouTuber Jaclyn Hill. Its a collection of foil, shimmer and matte shadows and has a wide range of colours to work with. The Huda Beauty one looks so glamourous!! I think I’m going to slowly be obsessed with the brand soon. I have the Warm Brown one of this palette and I’ve reviewed it. I think you’ll really enjoy it and it has swatches. Feel free to have a look and maybe let me know what you think! So jealous of your palette collection!